Heat oil in large nonstick skillet over medium-high heat. Add shallot and stir 20 seconds. Add Brussels sprout leaves and pistachios, and sauté until leaves begin to soften but are still bright green, about 3 minutes. Drizzle lemon juice over. Season to taste with salt and pepper. Transfer to bowl and serve. Four servings. 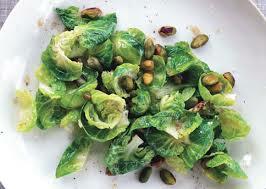 This entry was posted in Recipes, Recipes from Danielle's pantry, Sides, Vegetarian and tagged Brussels sprouts, lemon, pistachios. Bookmark the permalink. I love sprouts! Great with blue cheese and gnocchi too! Today is National Pistachio Day – how fitting!